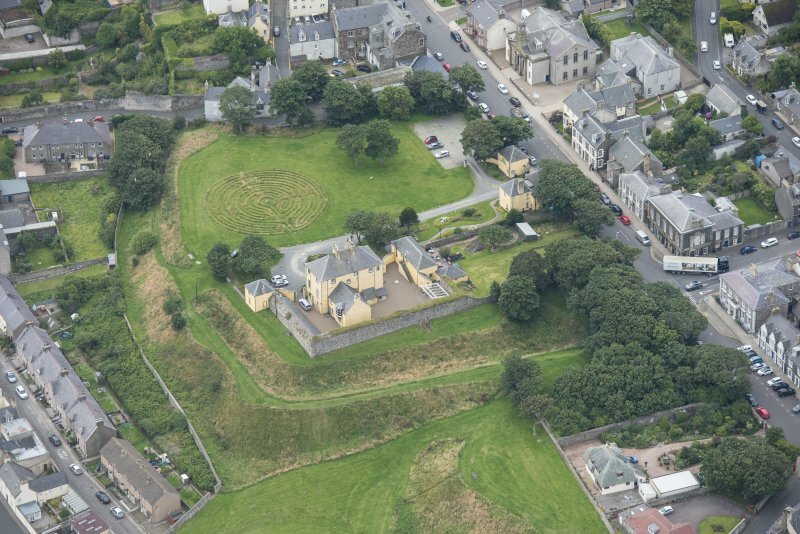 Oblique aerial view centred on the house and gate-lodge, taken from the S.
Oblique aerial view centred on the house and gate-lodge, taken from the SW.
View of South front, Banff Castle. 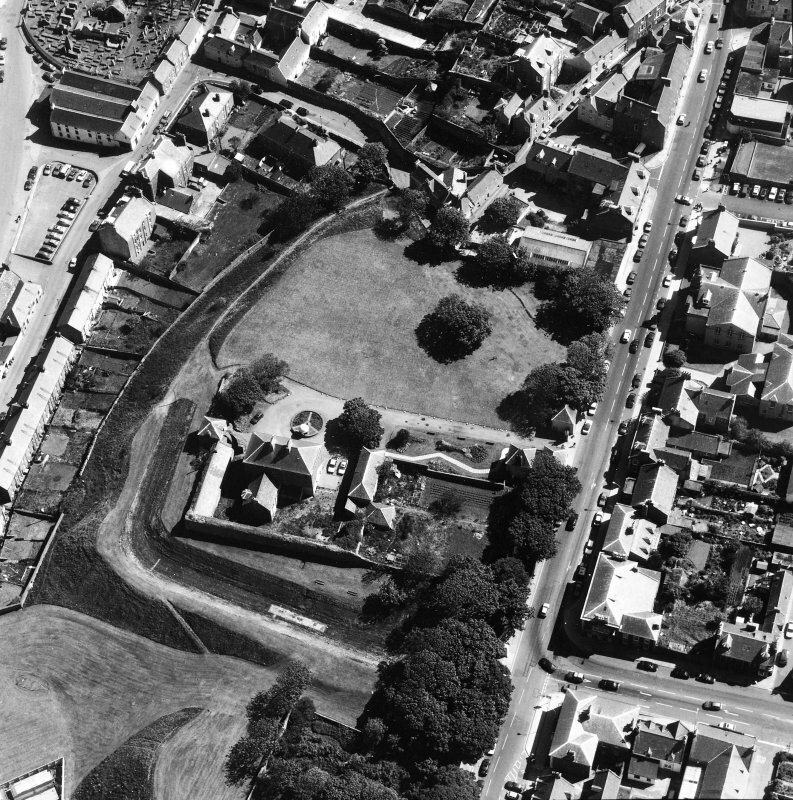 Oblique aerial view centred on the house and gate-lodge, taken from the NNW. A plain modern building now occupies the site of the old castle, but part of the old wall and ditch are still in a good state of preservation. 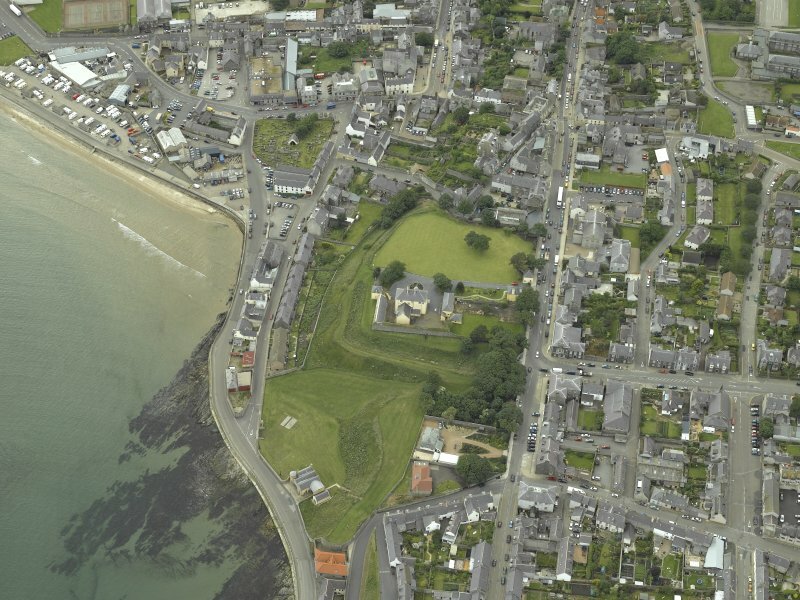 Examination of the ruins leads to the conclusion that Banff castle was 12th century, probably erected in the reign of David I. 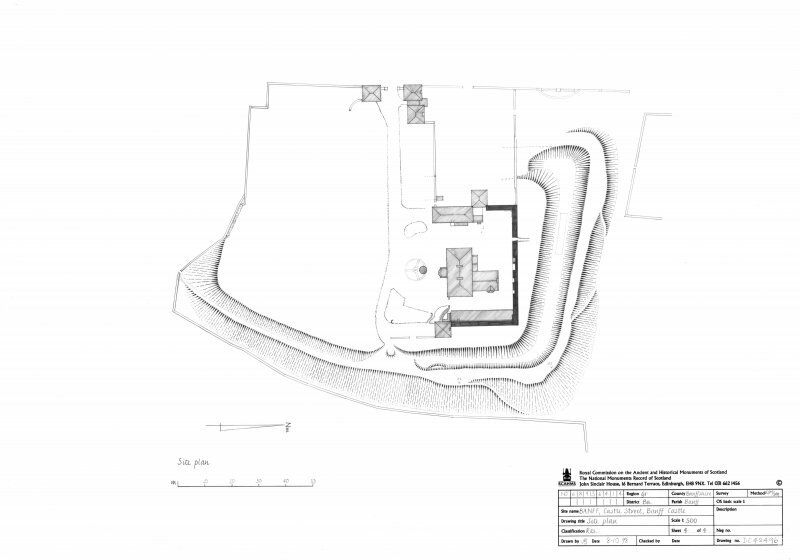 It seems clear that Banff Castle had a motte. The north wall and parts of the east and west walls of the castle remain. The north wall is 144 feet long, the east 82 feet and the west 36 feet. 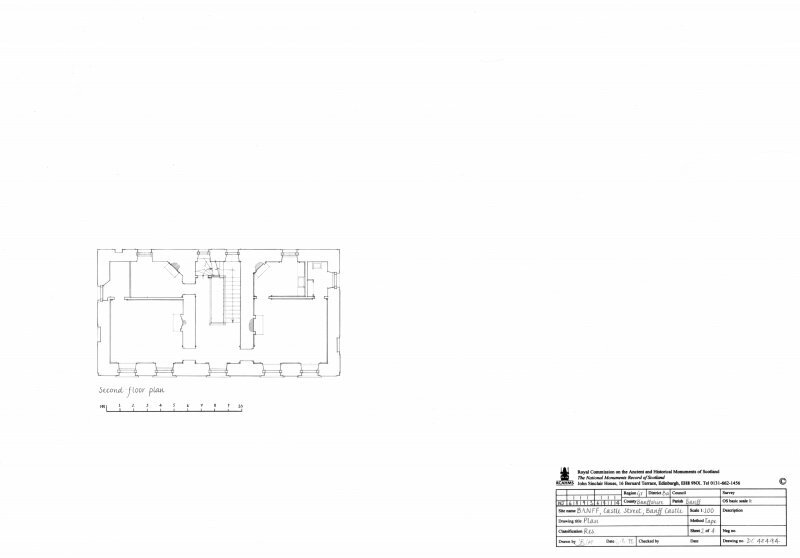 The walls are 18ft high and 6 feet 4 inches thick and are formed of solid masonry. In front of the house is a well 33 feet deep, which was probably within the ancient courtyard. It is lined with dressed freestone, and holds water to a depth of 16 feet. The part of the moat remaining forms two sides of a rectangle. The northern limb is 250 feet long, the eastern 156 feet, and the depth 20 feet. The width across the top is 44 feet and across the bottom 19 feet. Many antiquarians consider that it was a dry moat. The present house was built in 1750. 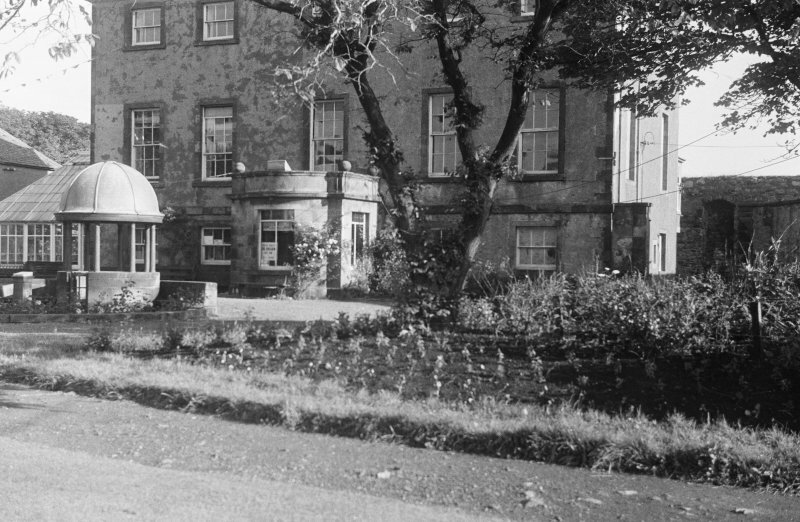 A part of the house, built by Archbishop Sharp's father was pulled down about 1816. The modern castle remains very much as it was built in 1750. (NJ 6882 6421) The remains of the castle are as described in Mahood (1919). The dry moat, in good preservation has a maximum depth of 3.4m on the NW side. The steep scarp on the north and east sides of the ditch has a maximum height of 5.4m at the NE angle. The well is at NJ 6892 6418. It is covered with a concrete slab and a dome-shaped structure, 2.4m in diameter and c.3.5m in height, has been built over it. To the NW of the castle, beyond the moat, there is a large garden (NJ 6888 6427) surrounded by a high wall. The remains of the wall of the castle attain a height of 3.2m. The present house, built in 1750, is a plain, harled building of three storeys, it is now a community centre. Visited by OS (EGC) 10 October 1961. 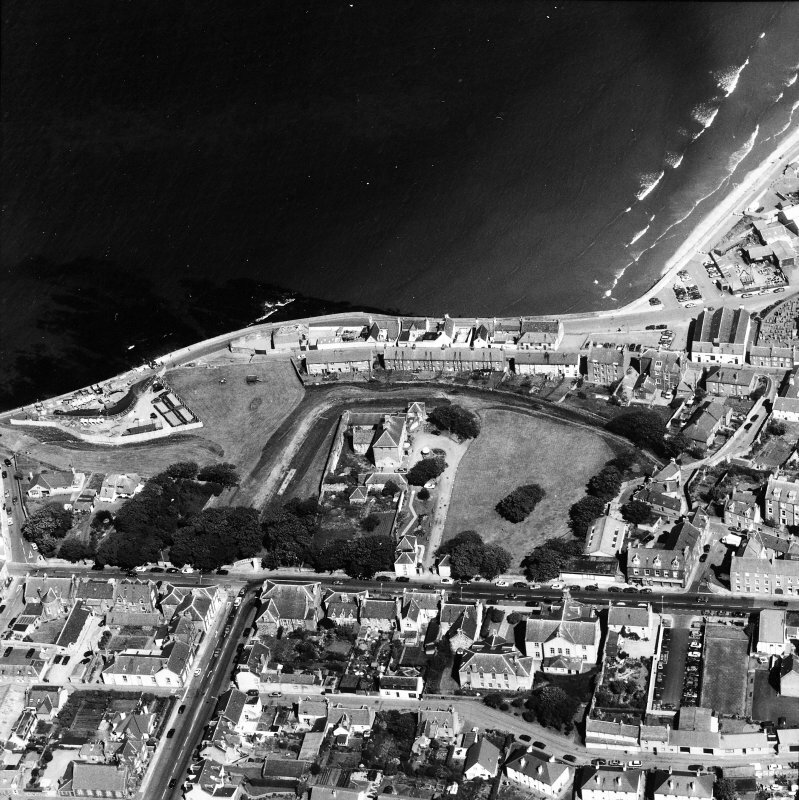 The remains of Banff Castle are as described by Mahood (1919) and Cameron. According to a note about the castle (source unknown) which is framed and hung up in the community centre, a castle is mentioned in the 12th century, and Edward I stayed at a castle in Banff in 1296. The rolled moulding on a round-arched sally port in the N curtain wall suggests a 16th century date for the existing remains. A shallow discontinuous depression running E-W across the lawn to the S of the community centre, almost certainly indicates the course of the moat with a possible central causeway. The name 'Castle' as applied to the community centre is obsolete. 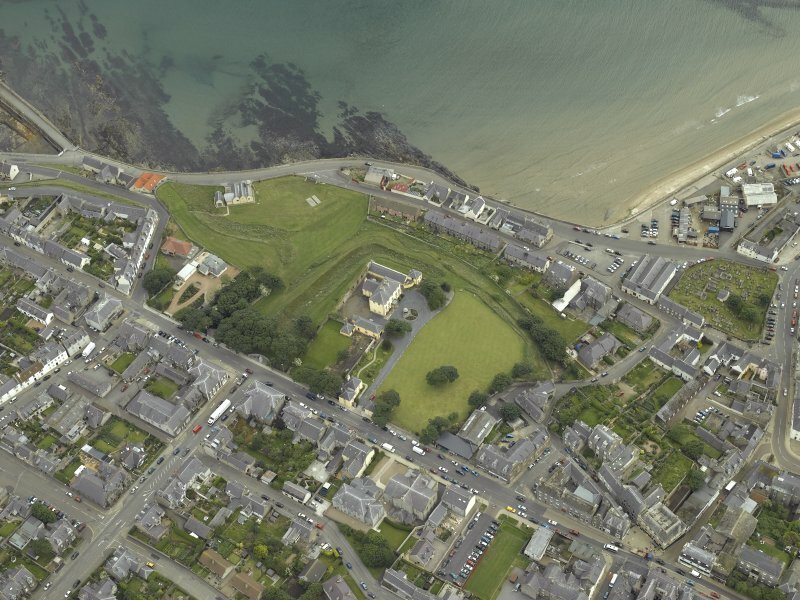 NJ (6893 6420) A watching brief and archaeological recording were carried out between April and August 2003 during the installation of new drains within the castle grounds and the reroofing of the East Pavilion building. Little remains of the late 12th/13th-century castle of enclosure, apart from sections of the substantial curtain walls and wide ditches and ramparts. A photographic survey of the internal elevation of the E wall of the East Pavilion, thought to be part of the medieval curtain wall, was undertaken. No attempt was made to remove the plasterwork or earlier pointing on the internal face, and so little architectural detail was visible. The repointing and consolidation of the top of this wall was also observed. The wall, at its surviving height, was found to be of small rubble construction with no cut stone or other stone of architectural significance evident. 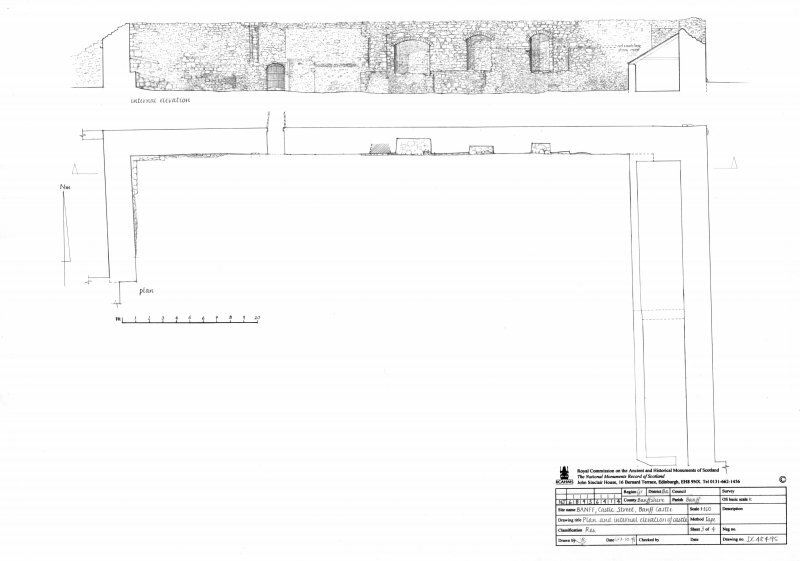 Four of the five new soakaways and drains were located within the curtain walls but no archaeological features or finds were evident. The fifth ran from the SE corner of the East Pavilion, eastwards into the moat for 6.2m. No cut for the moat or ditch was observed, and it appears that the ground level was raised and landscaped at this point. Sponsor:	Banff Castle Community Association. 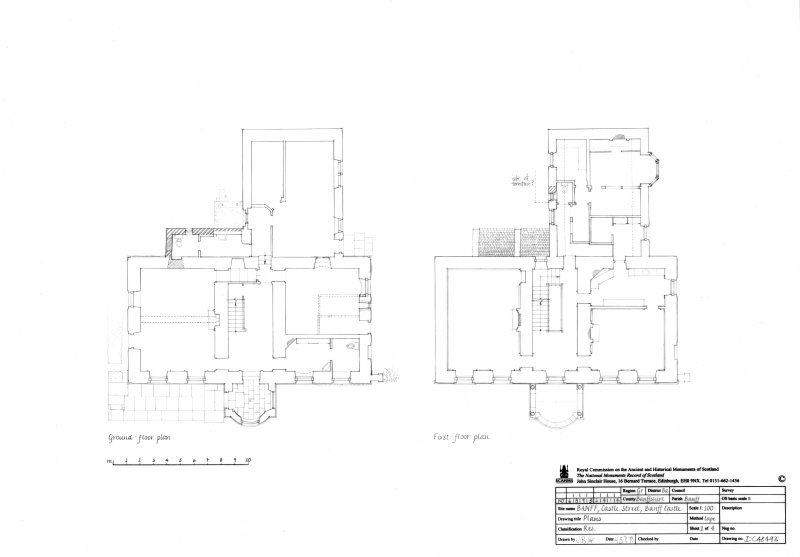 Source list (typescript) of material on Art & Architecture - Seafield GD248 / R6, page 30. 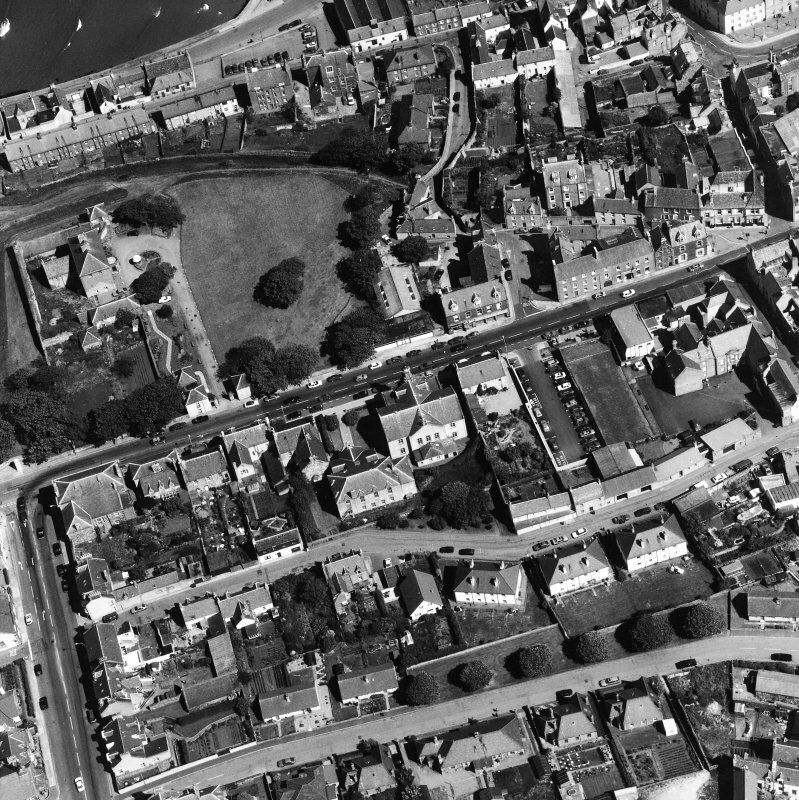 Photographic survey of buildings in Banff by the Scottish National Buildings Record in 1954. 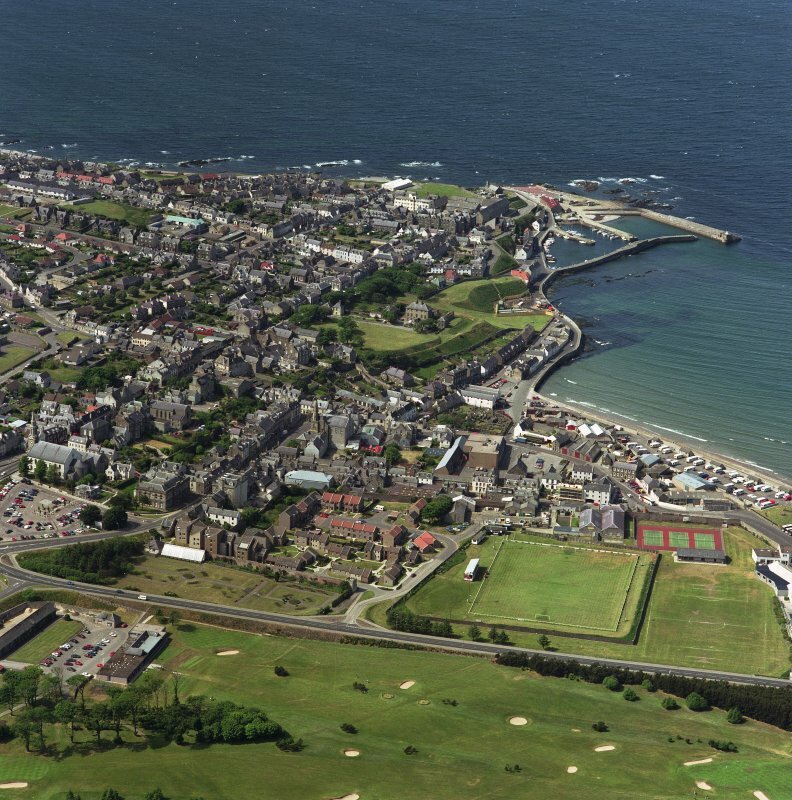 The existence of a sheriff at Banff in 1242 implies that a castle was at the burgh at that date. The present castle, now a community centre, dates from 1750. 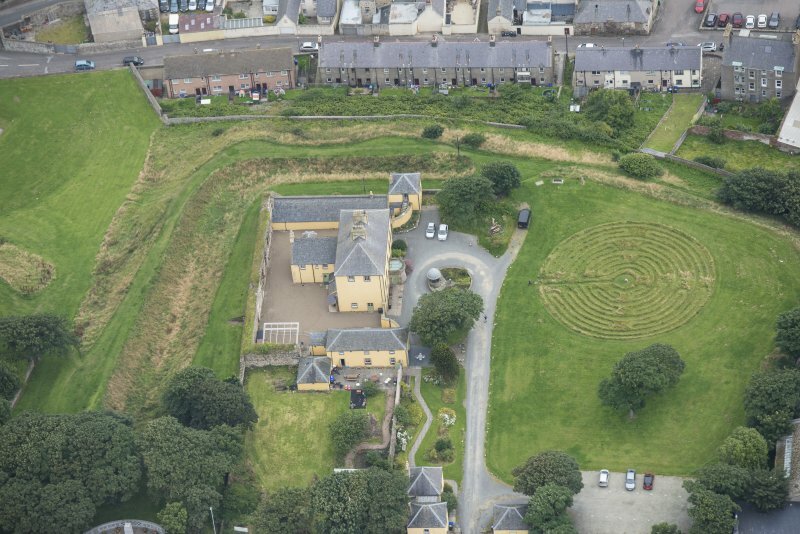 It is unknown whether the former castle was abandoned, altho'1gh one observer, writing in 1724, noted that 'to the north of the toune stands the Castle of Banff. ... a pleasant dwelling with a wall and of old fortified' (Cramond1 1891, 17}, Until 1820 a small seventeenth-century building, reputed to be the birthplace of Archbishop Sharpe, was attached to the 1750 structure. Pococke, on his tour of Scotland, remarked that this later structure 'was a small house on the site of the Old Castle. 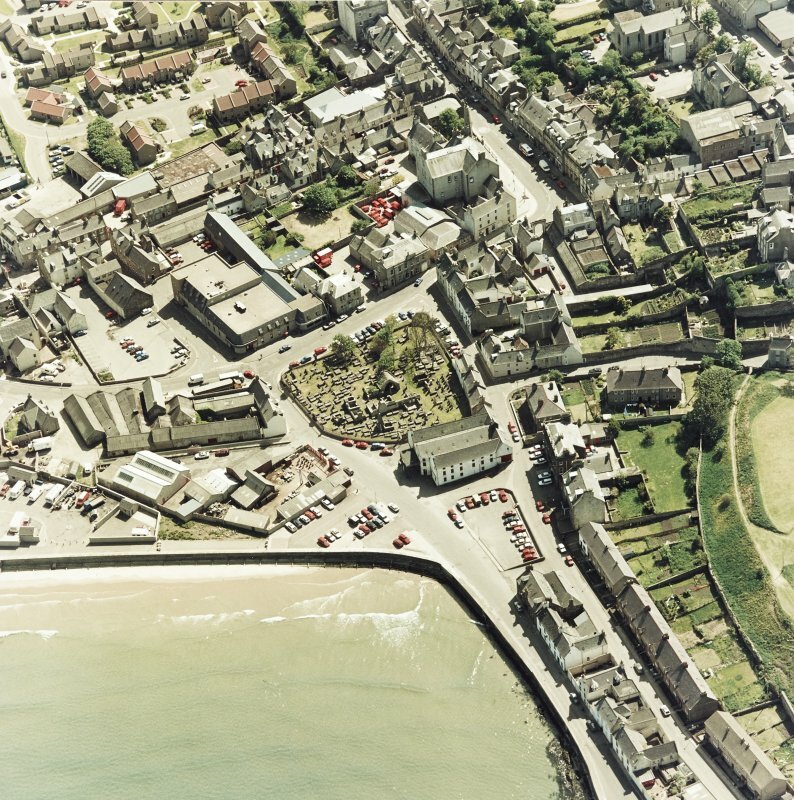 . . this precinct of the Castle was about 100 feet square, and a part of the Enclosure remains.' 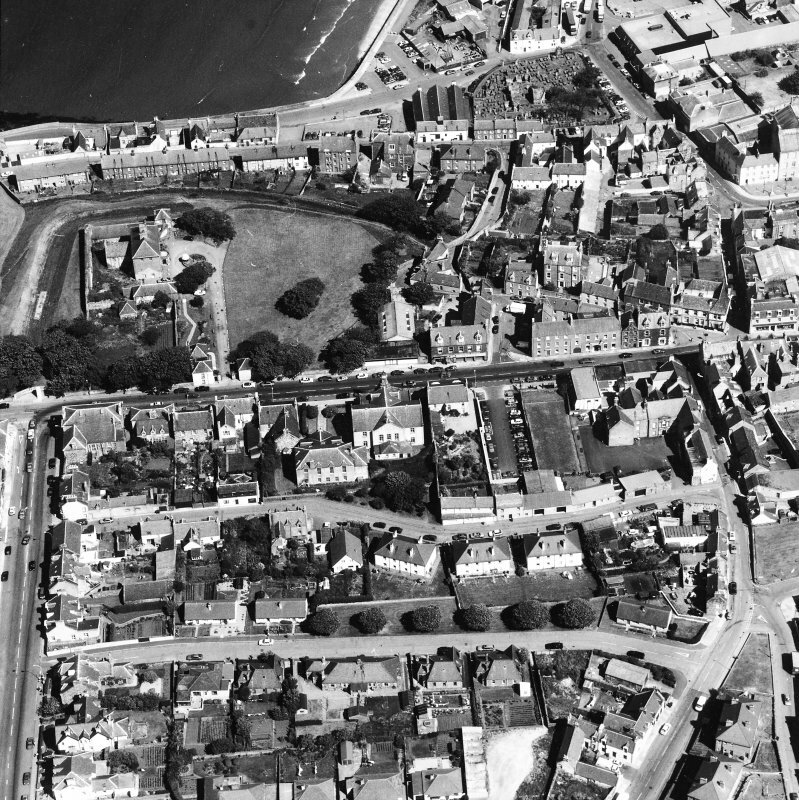 Pococke continued by describing the lawns and grounds around the castle, concluding that it was a 'delightful summer situation' (Kemp, 1887, 194). John Punbar has noted that the earliest surviving fragment of curtain-wall is not earlier than the late sixteenth century. 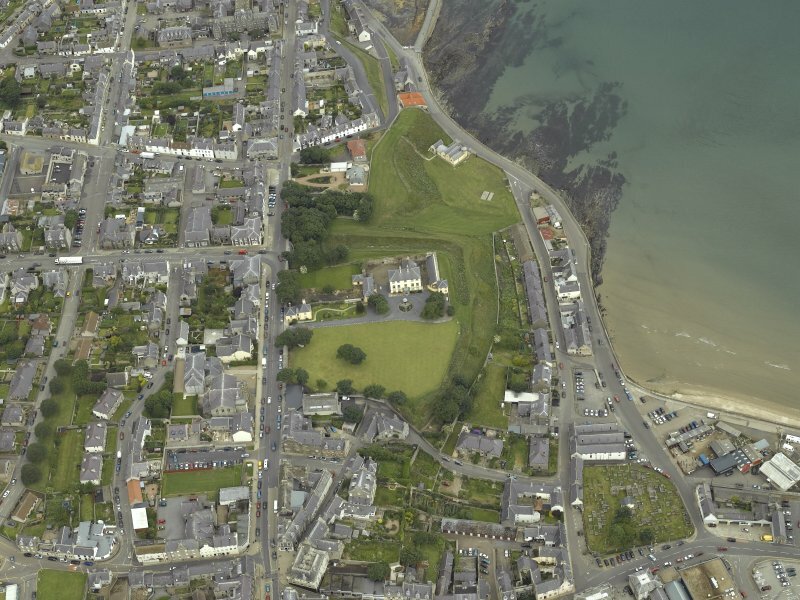 Francis Douglas, commenting in 1782, said of Banff Castle 'on the sides, and in front of the house, walks and terraces have been cut and levelled .... '(1782, 297). It is likely that the medieval ditch and bank were tidied up during the course of these operations. Information from ‘Historic Banff: The Archaeological Implications of Development’ (1977). Three surveys were carried out by on 16/12/2001, in March 2002, and May 2002. 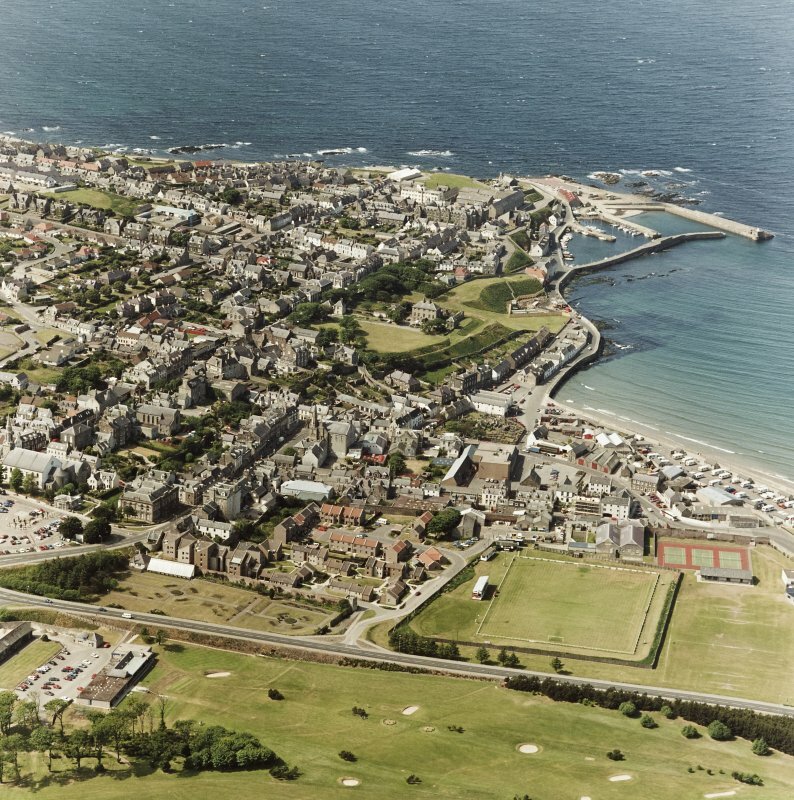 An archaeological excavation was undertaken as part of the Moray Coast Wastewater Project on the site of proposed pumping station at the foot of the seaward slope of Castle Hill, Banff. An earlier evaluation had established that stratified archaeological deposits survived on the site, which could not be preserved in situ. 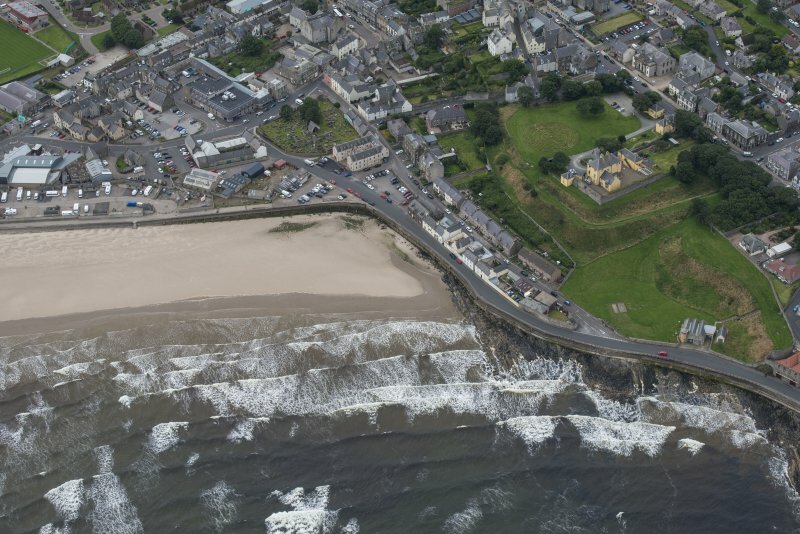 The subsequent excavation revealed a ditched enclosure, possibly associated with Banff Castle, and an extensive spread of midden dominated by waste from fish and shellfish processing. A large assemblage of medieval pottery, including decorated jugs, and artefacts relating to the fishing industry was also recovered from the midden. A high ratio of deer bone within the midden suggests the waste also derived from a high status site, such as the Castle. 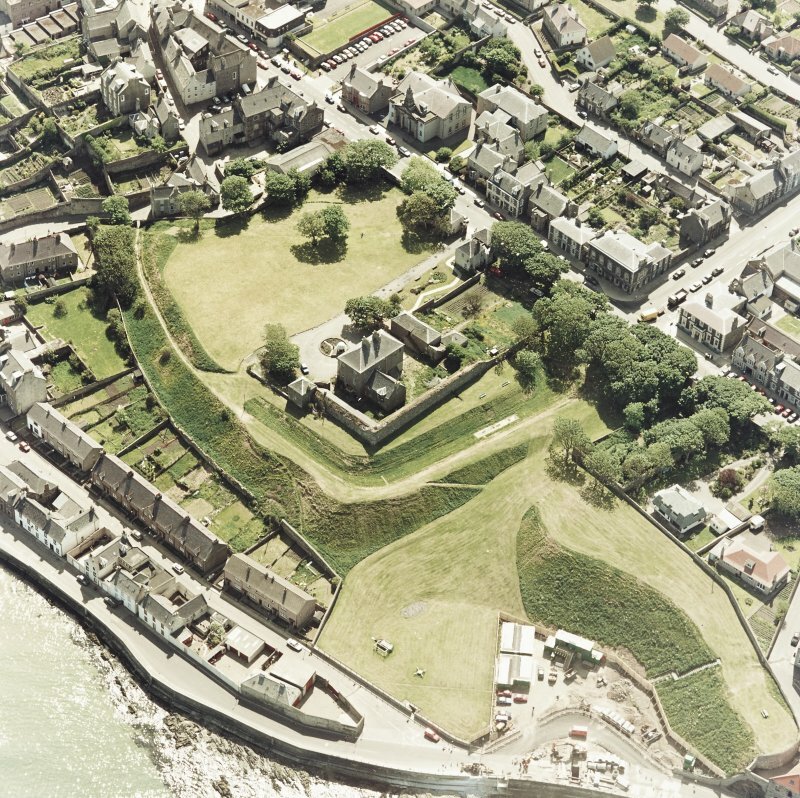 In the final phase of activity, a rectangular building was constructed on top of the midden deposits, possibly an outbuilding associated with the Castle. The evidence recovered is considered to be important both in a local and regional context, and the evidence concerning the medieval fishing industry is of national importance. A programme of post-excavation analysis was undertaken on the recovered assemblage. 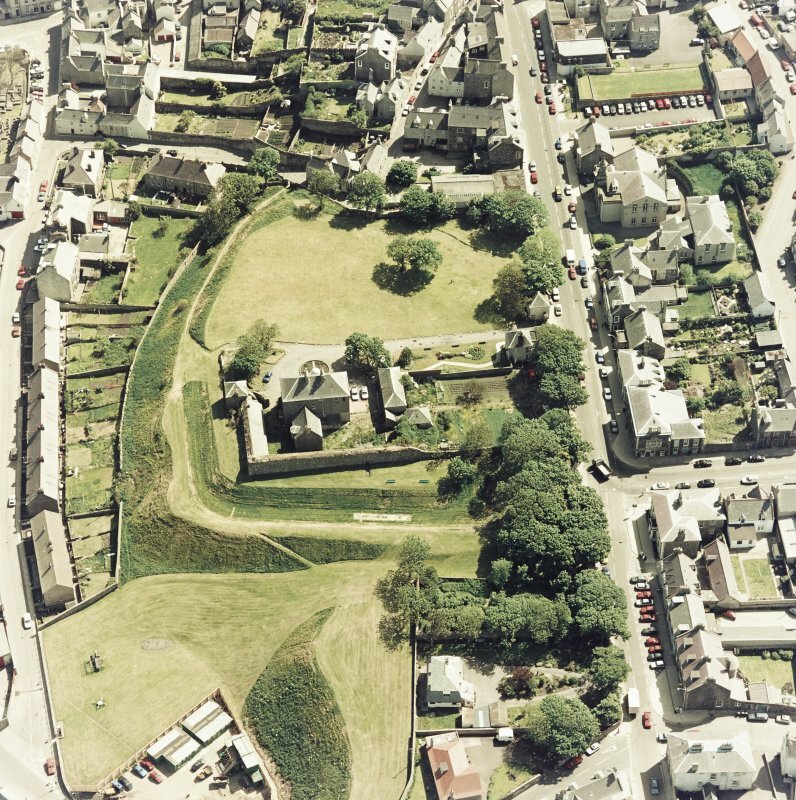 A watching brief was carried out during the excavation of a 5m long x 1.8m and 1.9m deep trench to locate a drain within the Scheduled Ancient Monument of Banff Castle. 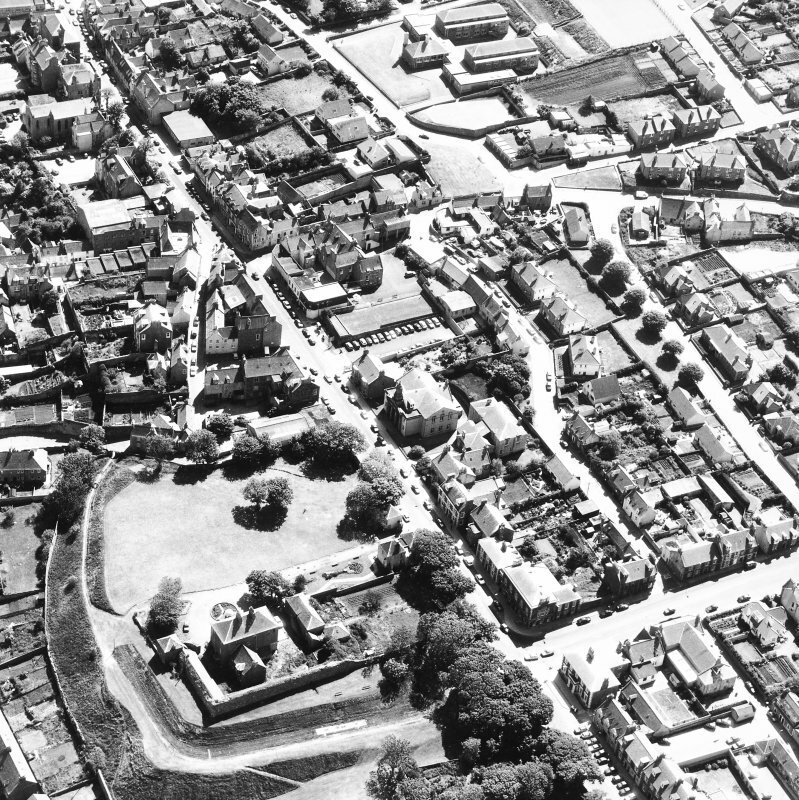 The trench was located a few metres E of the boundary wall separating the site from Castle Street and to the NE of the wide ditch on the N side of the castle curtain wall. No archaeological features or finds were evident.